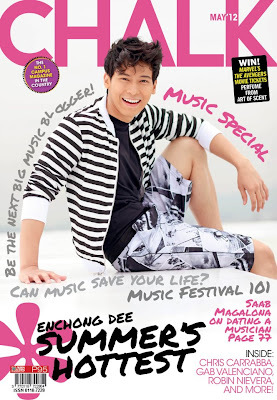 Summer and music are the highlights of Chalk Magazine May 2012 issue. On the cover of the number one campus magazine of the Philippines is Enchong Dee, clad in board shorts and striped tees as he sailed away in Hong Kong. The venue of the shoot is in a cruise ship, amidst strong currents and chilly air. Enchong didn’t seem to mind wearing nautical themed summer clothing despite the cold; he made the most out of the location even though he was freezing. Enchong definitely pulled out the summer-happy May cover of Chalk. Stylist Sidney said that Enchong is a pro; very easy to work with and he knows how to work the camera. Find out more about the behind the scenes of the shoot and his exclusive interview on “The Boy Who Could”, a special on Enchong Dee’s life, career and dreams. In this special, the Maria La Del Barrio hottie also shares his thoughts on his dream girl, Julia Montes. Also inside is the Music Special where artists raise the flag of OPM. Read about Bamboo Manalac, Zia Quizon, Fil-Brit Reality TV star Charlie Green, YouTube sensations Krissy and Ericka and more! Saab Magalona will also give us a primer on dating a musician and Chalk will take us to the exhilarating Music Festival in Jakarta, Indonesia. And if you are looking for the perfect summer ensemble, take beauty inspiration from music’s latest muses, Adele, Ke$ha and Katy Perry. Get all these and more in Chalk’s May issue, available now on newsstands. For more updates, follow CHALK on twitter (@chalkmagazine) and like us on facebook www.facebook/chalkmagazine.